TECHSYS Review 2019: Is TECHSYS a Good Hosting? Uganda-based hosting vendor Techsys was established in 2008. The company offers a variety of services ranging from web hosting solutions to server rentals and domain registration. 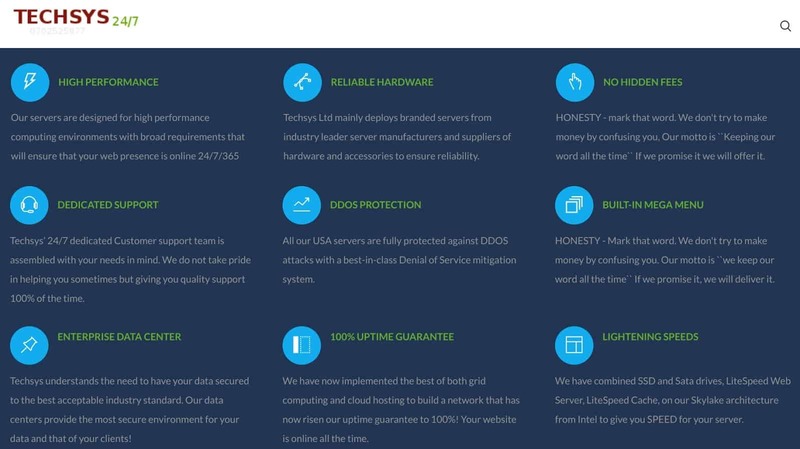 Founded in 2008, Techsys is web hosting company based in Uganda but with data centers located in the U.S., the U.K., Germany, the Netherlands, and India. They offer shared hosting, VPS servers, dedicated servers, reseller hosting solutions, server rentals, and domain registration services. Their website is in English. This vendor’s email hosting solution includes features such as unlimited POP3 email accounts with SMTP, anti-spam with SpamAssassin, unlimited autoresponders, mail forwards, 25 mailing lists, email aliases, and webmail access via user interfaces such as Horde, SquirrelMail, and RoundCube. Techsys uses modern data centers in the U.S., U.K., the Netherlands, Germany, and India. In all these data centers, clients’ data and files are protected by comprehensive security measures that include fire detection equipment, access restrictions, and immediate alerts in case of unauthorized access. In addition, the Techsys servers are installed with a DDoS protection system to keep client data safe from distributed denial of service attacks. This vendor’s SSD dedicated servers use solid state storage technology combined with modern server hard drive technologies for enhanced speed and high-end performance. The Indian servers use hardware architecture based on Intel Skylake for ultra-fast web services. In the event of hardware or software failure, the vendor’s cloud servers automatically take over all the tasks of the failed server so that the websites it hosts do not suffer any downtime. That said, it is important to note that Techsys provides no information about its backup policy, and – as far as I can tell – they don’t have a disaster recovery management service. Techsys has a well designed and easy-to-navigate website that provides new website owners with user-friendly platform. Techsys is one of the cheapest hosting vendors in the market. Besides offering cheap packages, their plans have excellent features with many unlimited services. They also offer a variety of free services such as free website transfer, free domain transfer, free MySQL transfer, and free script transfer. However, their dedicated plans hosted on Indian servers are quite expensive compared to plans in other countries such as the U.K., the U.S., Germany, and the Netherlands. Their dedicated plans also include a setup fee. This vendor does not make you commit to long-term contracts. Instead, they have adopted a pay-as-you-go payment model that allows customers to quit at any time. For entrepreneurs who shy away from long-term hosting contracts, these pay-as-you-go plans may be perfect. As if this wasn’t sufficient incentive to take the plunge, they also offer a 30-day money-back guarantee. When it comes to any uptime guarantee, this depends on the server location. U.S.A. and European servers come with a 100% uptime guarantee. With Indian servers you get a lower 99.6% uptime guarantee. In the event of any downtime, Techsys promises to solve the underlying issues within an hour. And if you experience three unresolved issues in any month, they promise to refund 50% of that month’s hosting fee. Techsys customers can reach out to their 24/7 technical support team via live chat, email, telephone or ticketing system. The team is extremely responsive and quite helpful, and their support is complemented by a comprehensive knowledge base that includes a blog and an FAQ section. Techsys is an all-rounded hosting provider. Their customer service is excellent, they have fair prices for most of their hosting plans, and they provide reliable solutions in Uganda, India, and the rest of the world. Wondering how TECHSYS stacks up against other Web Hosting companies? Enter any other Web Hosting company and we will give you a side-by-side comparison.